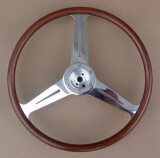 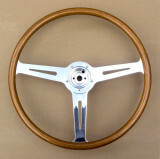 These steering wheels are great choices for Porsche 356 replicas as well as Austin-Healey Sprite, Triumph and Lotus. 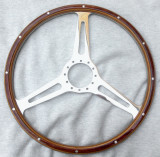 In addition to my hubs, they will fit both Nardi and Momo style adapter hubs. 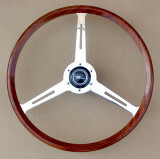 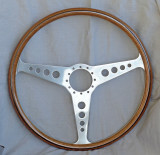 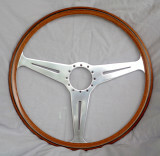 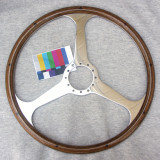 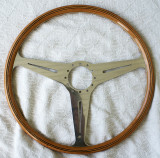 Replica Porsche VDM GT Wood Rimmed steering wheel - 550 Spyder - 15"
NEW STYLE - Nardi Style Small Hub 15"
Les Leston Style Down-Slant 14.5"
Bugeye / Sprite Falcon Le Mans 15.5"
Maserati Drilled or Solid Spoke 14.5"
NEW STYLE - Nardi Style Drilled Spoke Small Hub 15"
Can you inform me about availability & price for a wood steering wheel for a 1965 Lotus Elan S2. 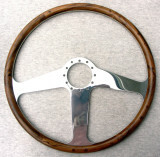 What is the diameter of this steering wheel?